Urbanization fundamentally changes ecosystem function and structure and has profound effects on wildlife populations. 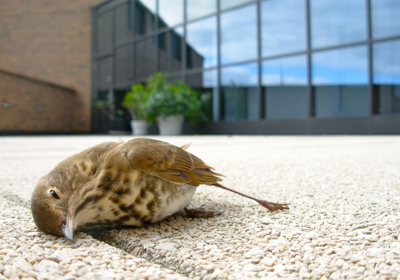 Birds that reside in urban settings face numerous human-related threats to survival, including mortality from bird-window collisions (BWCs). 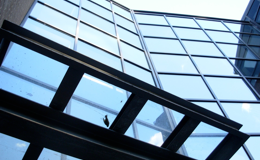 Window glass is an invisible barrier to birds, and collisions occur as birds attempt to fly through what appear to be images of open space and vegetation. Understanding the nature of BWCs is important because urbanization is accelerating faster than human population growth, and knowledge of how the urban environment affects bird survival is needed for conservation and management. Previous work has demonstrated that the local drivers of BWCs are the amount of windows in buildings and proportion of habitat available to birds in urban areas (Hager et al. 2013). For example, buildings with high window area and levels of green space are patchily distributed across the urban landscape and both window area and development work in concert to create spatial variation in mortality. Birds that reside in urban settings face numerous human-related threats to survival, including mortality from bird-window collisions (BWCs). What are the drivers of BWCs at local and regional scales? Is there variation in drivers of BWCs among regions of North America? Does collision mortality affect the population health of affected species? Can the factors that drive BWCs be used to model collision mortality across the urban landscape? Can models of mortality be used to inform conservation practices that minimize impacts resulting from window collisions? Despite advances in our knowledge of how BWCs vary at small scales, we understand little about (1) the factors that influence BWCs at local and regional scales, (2) spatial variation in BWCs throughout North America, and (3) how BWCs work in concert with other factors to affect the population trajectories of affected species. Hager, S. B., B. J. Cosentino, K. J. McKay, C. Monson, W. Zuurdeeg, and B. Blevins. 2013. Window area and development drive spatial variation in bird-window collisions in an urban landscape. PLoS ONE 8(1): e53371. doi:10.1371/journal.pone.0053371. Hager, S. B., B. J. Cosentino, and K. J. McKay. 2012. 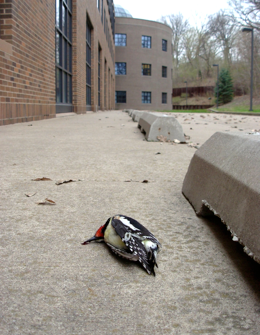 Scavenging affects persistence of avian carcasses resulting from window collisions in an urban landscape. Journal of Field Ornithology. 83(2): 203-211. Hager, S. B. 2009. Human-related threats to urban raptors. Journal of Raptor Research. 43(3): 210-226. Hager, S. B., H. Trudell, K. J. McKay, S. M. Crandall, and L. Mayer. 2008. Bird density and mortality at windows. The Wilson Journal of Ornithology. 120(3): 550-564. We are testing the hypothesis that the pattern and magnitude of BWCs among urban areas reflect landscape structure and functional connectivity. For example, sites in large cities settled along migratory pathways should display high variation in BWCs across the landscape, whereas low variation in BWCs might be expected at towns consisting of only relatively small buildings (i.e., low window area) outside of major migratory routes. This hypothesis is be tested with the assistance of nearly 20 collaborators located at sites throughout much of North America. A complete description of this collaborative project may be found HERE.